There are some bars that personify the neighborhood they are in. 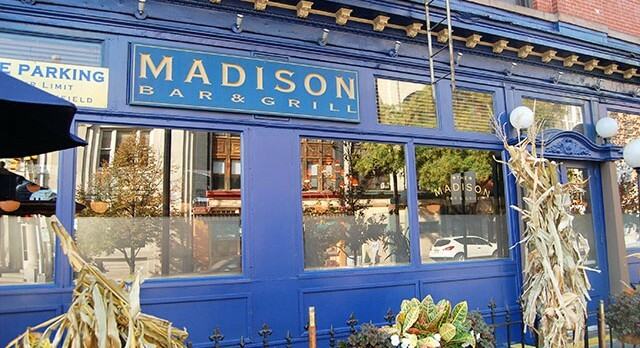 Madison Bar and Grill is one of those places…being the premier bar in uptown Hoboken as it is farther away from the horseplay that comes from the PATH, closer to the pricier Ferry. The area’s picturesque brownstones feel slightly older and more professional. And the Madison exudes class and more adult fun. When walking into the Madison, which is coincidentally not on Madison Street, but instead located on the corner of Washington Street and 14th Street, the first thing I noticed was the large chandelier hanging above the bar room. The ceilings above the chandelier look like a painted/stained glass conveying the owners’ aspiration of having a classy yet comfortable place up town. It feels like you are inside one of those upper-class war era brownstones enjoying a few libations. My date and I grabbed a couple of seats at the bar as the front room started to fill up. It was happy hour which meant half priced beers, wines, well drinks, margaritas and sangrias, which was great news. Big props to the bartender for letting us know immediately what the specials were so that we didn’t have to look cheap and ask. I ordered a Stella Artois which was very tasty- only minuscule points get subtracted for giving me a little too much head that spilled over the top instead of cutting it off at the tap. My date ended up having a couple of vodka soda drinks which were gulped down happily. While sitting at the bar we enjoyed listening to the music which wasn’t too loud, nor bassy and did not interrupt the conversation. We heard a bunch of Sublime, some Offspring and some Mumford & Sons, and overall a whole lot of good music. Behind the long bar which seats about 22, were about 6 TVs all angled perfectly so everyone in the place was able to watch any of the action. The bar was festively decorated with garland. The lights above the marble bar were red and green giving off a Christmas hue. Posted up behind the bar were 40 or so stockings with various names on them, perhaps all of the employees of the Madison. Besides the happy hour specials that extend from 4-8pm on weekdays, on Tuesdays they also offer half-priced martinis. The Madison Bar and Grill has over 20 martinis. While I am never one to order anything as girlie looking as a martini they do have tons of innovative ones. Besides the traditional flavors they have “Yummy Gummy Bear,” which is self-explanatory, but also the “Fugazi martini,” the “Vesper martini,” and countless others. After a couple of beers it was time to move on, but I definitely enjoyed my Thursday night at the Madison Bar and Grill. Preconceived notion –I used to hold something against the Madison. While I really enjoyed dinner here in the past, I really used to get annoyed that on Friday and Saturday nights they don’t let men in under the age of 25. I guess I just felt “who are they to tell me I can’t drink at their bar as long as I was above the legal drinking age?” Now being above 25 I understand that they didn’t want any riff-raff, but still, that’s really annoying to those under 25- especially when the girls you are hanging out with are permitted to go in. Crowd stereotype – Professional, most people 30ish and up. Value – The half priced drinks for happy hour were very helpful in keeping the bill way down. Date – Definitely take a date here. Hookup – Maybe on a weekend night. And I guess if you are a girl under 25 looking for an older, more professional man, it’s a good place to go. Dance – Maybe late night, but I am not a dancer. Overall – Despite my previous prejudice against the some of their policies, there is no denying that the Madison is the go-to bar in uptown Hoboken. With plenty of TVs line the place, a comfortable interior, a happy hour that makes it feel like they are giving away drinks, it’s absolutely as good as advertised. I love what the owners did to Clinton Social and likewise Madison Bar and Grill is another place that I will definitely go back to. If you are in uptown Hoboken you gotta go… I’ll give it an 8.8.